National unplugging day falls on June 25th this year and it’s a day for families to #gogadgetfree and spend time doing things together rather than their gadgets. 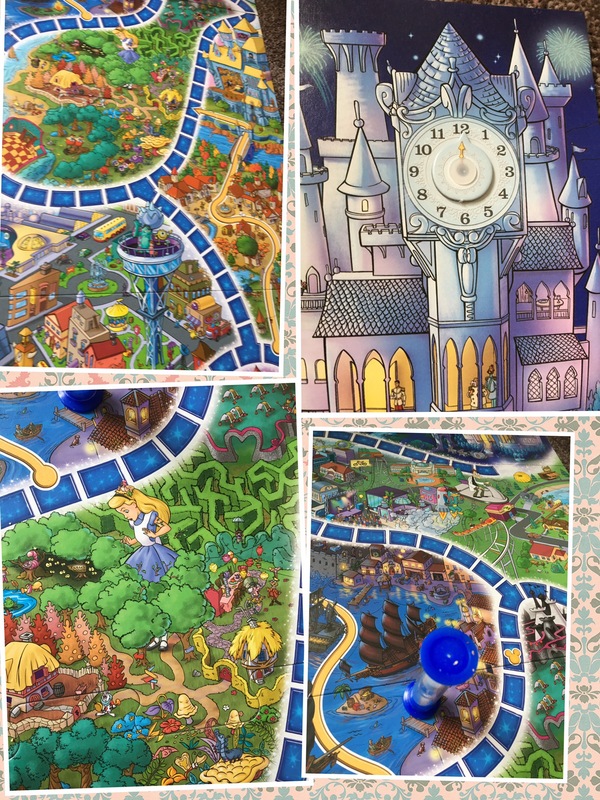 To celebrate the third year of National unplugging day, Ravensburger offered us the choice of one of their popular board games to help us put down our gadgets even if only for a short while. 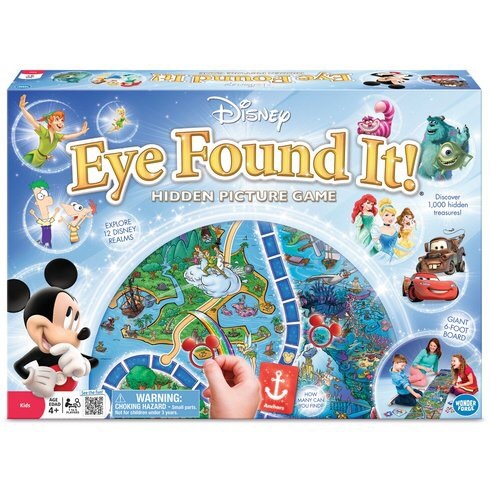 We chose the new Disney eye found it family game. It’s a coincidence that I also spotted the exact game at the blog on conference just over a week ago. 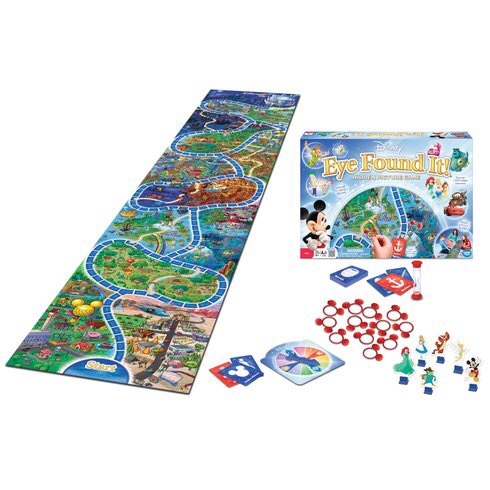 I had not previously heard of this game but I am glad I chose this particular one as we all love playing it and as it’s aimed at age 4 and over it means all of us can play together. The first thing to know about this game is that the playing board is huge. This must be the biggest game board we have ever come across as it measures a massive 1.80M. If your more used to feet and inches then that converts to a whopping 5ft 9 or there abouts so yes it’s bigger than us all. There are six playing pieces all of which are well known Disney characters of course. Plus a spinner with numbers 1-8 and a few other symbols, game cards and then the red rings which I will explain shortly. The huge board comes in 3 big sections which all come folded in the box (yes it’s really big) they all slot together like a jigsaw and then the completed board shows many Disney film scenes and characters such as Winnie the Pooh, Aladdin, Tinkerbell, Monsters inc etc. It’s a very pretty board to look at. Oh yes there’s also a sand timer thing too! And this is the spinner! The aim of the game is to get all the way to the cinderella at the very top of the board (1.8m up) before the clock turns 12. To do this players must take turns spinning the spinner. A number 1-8 means move that many spaces. If a player spins on a clock face then this means the clock goes forward either one or two hours. 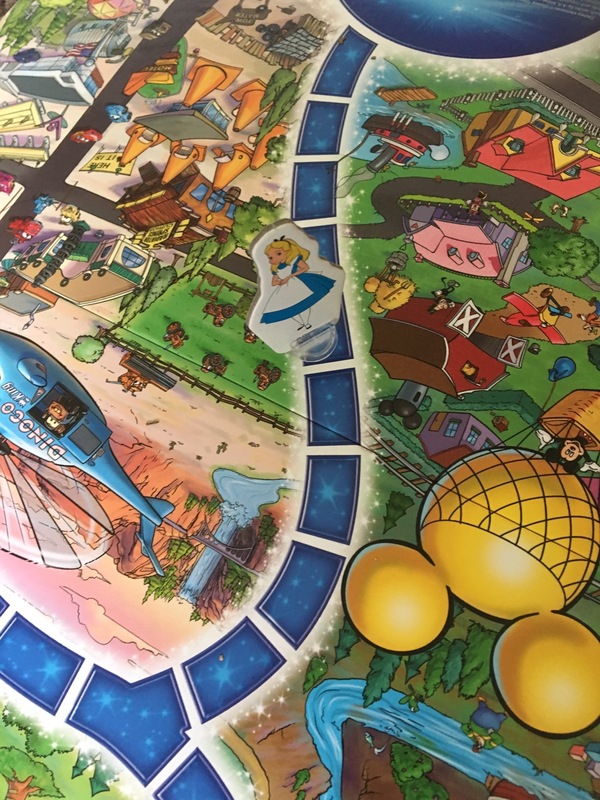 If the spinner lands on the Mouse head then a card is chosen which all have images on and all the players frantically search for the same hidden object amongst the pictures on the board before the sand timer rubs out. There are hundreds of images hidden, finding them can be tricky but they don’t need to look exactly like the one on the card. When images are found the small red rings get placed over them and then counted and every player gets to move that many places. 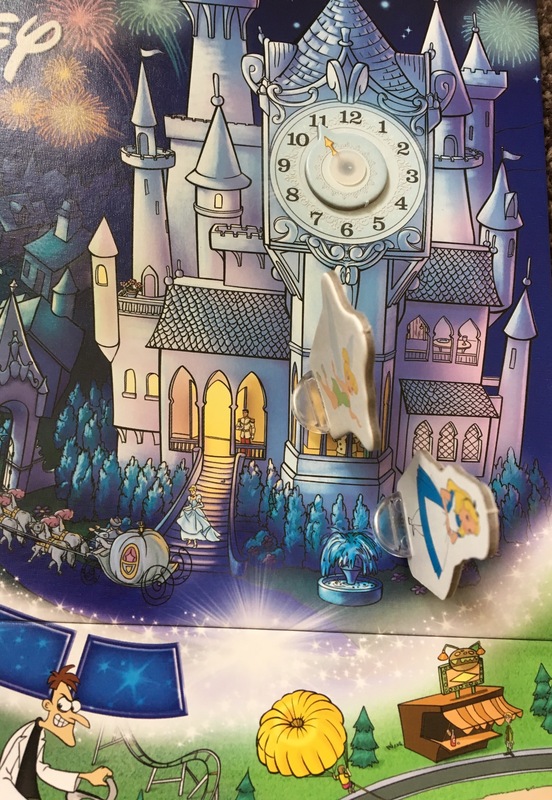 To win, all players have to reach the castle before the clock reaches 12. Six people can play. It gets more difficult with more players as there is more chance of a player spinning a clock face and thus advancing the hours but on the other hand – more people to find hidden objects. If the clock gets to 12 before players reach the castle then it’s game over and start again. This really is a lovely fun game to play. 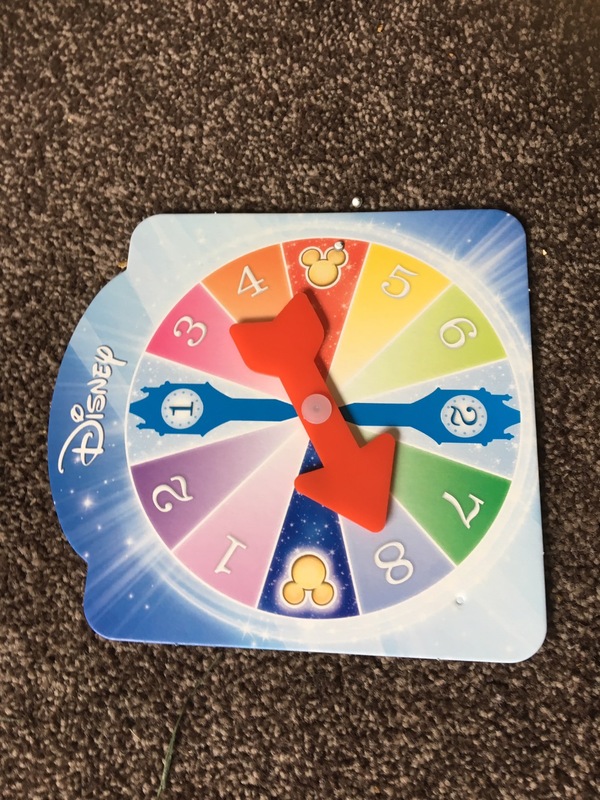 As long as there is no cheating if the spinner lands on the clock then it’s down to lucky spins whether we make it to the castle or not. This game costs about £20.00 or there abouts from most good toy stores.